Fifth-grade students read prayer intentions in the presence of classmates, teachers and representatives of the Brooklyn Diocese and DeSales Media Group, during a blessing ceremony at Our Lady’s Academy. Msgr. Kieran Harrington prayed for the students to use the school’s new technology in accordance with Catholic virtues. As part of an ongoing collaboration between Catholic Television Network (CTN) and Clearwire Corp., five Catholic schools in the Diocese of Brooklyn were provided technology makeovers. DeSales Media Group, the parent company of CTN and The Tablet, hired Vectro Network to install wireless Internet access throughout the school buildings and to award the schools 30 laptops each. Michael Monks, vice president and senior engineer of Vectro, said bringing the schools up to date on the latest Internet capabilities was not an easy task because many of them were built with thick walls, making it difficult for the Internet to reach every student in the building. However, with the modifications his company has made, the schools should be able to handle future advances. The five schools that benefited from this makeover were: Salve Regina Catholic Academy, East New York; St. Mel School, Flushing; St. Francis of Assisi, Astoria; Resurrection-Ascension, Rego Park; and Our Lady’s Catholic Academy, Ozone Park. Coyne said that the school has been struggling with the fact that a limited amount of students were able to get on the school’s network. William Geasor, principal of Salve Regina, said children are already tuned in to modern technology because they use it in social aspects of their lives. 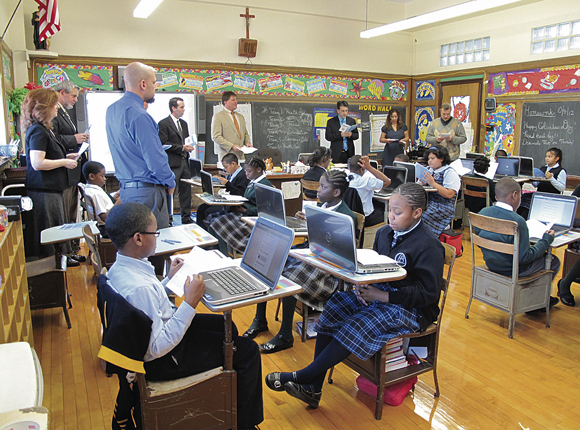 Representatives from DeSales Media Group and from the diocese, visited Our Lady’s Academy. Msgr. Kieran Harrington, diocesan Vicar of Communications, blessed the students and the newly installed technology. The group also had the opportunity to see how a teacher uses laptops and wireless Internet to better help students learn. Dana McCann, fifth-grade teacher, held a social studies lesson while the visitors looked on. She asked the students to search online for information relating to the key issues in the presidential race. The students had to search for the information themselves, giving them skills that will last well beyond the fifth grade. However what the students access online is closely monitored by the school faculty, said Bob Ralston, Vetro president. Gina Krainchich, director of educational media services for DeSales Media, said stable Internet connectivity is quickly becoming less of a luxury and more of a necessity. She said there are plans to have students take their state exams online by 2014.